"This larger rectangular baker goes from oven to table and is handcrafted of high-quality white firing clay. “Boleslawiec”, Poland features a wide rectangular shape that offers a perfect size for baking and allows easy cleanup, microwaved, dishwasher and freezer safe. Dimension: Approx. Across the top of the dish 12' x 10" x 2.75" high -.Across the base/bottom of the dish approx. 9.5" x 6.75"
POTTERY AVENUE HAS 3 SIZES, GET ALL 3 NOW! " 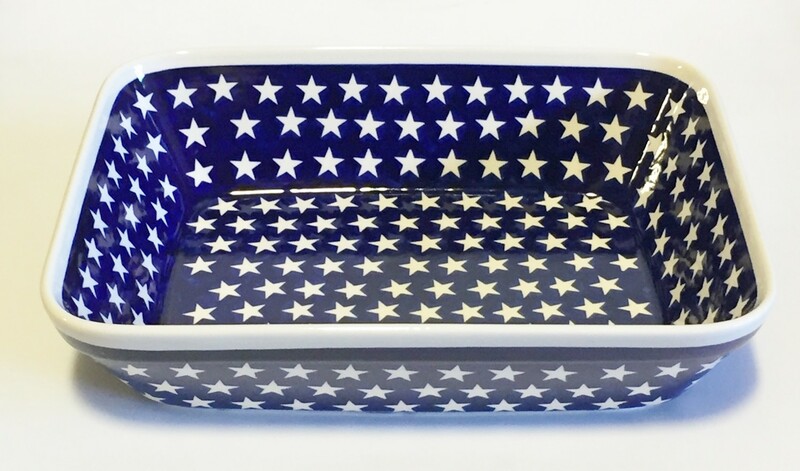 POTTERY AVENUE offers this blue and white STARS design. The rectangular 12” baker is a versatile Polish Pottery Stoneware kitchenware that goes from oven to table and is handcrafted of high-quality white firing clay and accented with a patented glaze formula making it durable for everyday use. This Polish Pottery Stoneware from “Boleslawiec, Poland” features a wide rectangular shape that offers a perfect size for baking and allows easy cleanup. It can be an ideal choice for medium casseroles, your favorite sheet cake or a large batch of cornbread. This functional art dish will retain the temperature for a long period of time and is manufactured to be used in the microwave, oven dishwasher and freezer. Dimension: Approx. Across the top of the dish 12' x 10" x 2.75" high -.Across the base/bottom of the dish approx. 9.5" x 6.75”. POTTERY AVENUE HAS 3 SIZES, GET ALL 3 NOW!